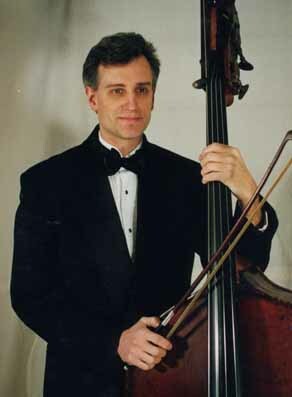 Ron Wasserman, a third generation musician and New York City native, is the principal bassist of the New York City Ballet Orchestra. He was a student of David Walter at the Juilliard School. He got his start in the music business at age three by listening to his father play drums in the ice show at the 1964 World's Fair. His first experience with the classics was under the baton of Leonard Bernstein while singing in the children's chorus at the Metropolitan Opera, and his first performance as a bassist on a professional symphonic job was performing with the New York Philharmonic as a member of the All-City High School Orchestra in an educational concert. Since then, he has played many other concerts in and around New York City, some of which audience members have actually paid money to buy tickets for. I consider one of the greatest honors of my life the fact that, besides having studied with David Walter for four years, I was privileged to be his colleague in the New York City Ballet Orchestra. As a matter of fact, the first time I saw him in the flesh was over the wall of the New York State Theater orchestra pit, where my grandmother had connived to have me accompany her on her subscription series. Ballet is not usually a prime choice in entertainment for the typical male teenager, but she had front row seats and I knew I could watch the orchestra from there. There he was, the erudite looking man who had stared out at me from the cover of my Music-Minus-One album. "What a serious, distinguished personage," I thought. It wasn't until a few years later when he was my teacher that I discovered the sophisticated sense of humor, his joie-de-vivre, and his brilliance, yes, his brilliance. More on that in a moment. He won me over as a potential student when I saw him give a hilarious impromptu lecture on how to adjust a bridge and sound post using nothing but common kitchen utensils. The part with the corn-cob tongs was the best. We had our lessons under a large bust of Toscanini. You've all heard the Toscanini stories! But before you roll your eyes at their mention, don't forget that he told them better than anyone, certainly better than the character "Mr. Toscanini Clarinet *Player" from Fellini's "Orchestra Rehearsal." I have a feeling Dave's ulterior motive was not just to entertain us, but to keep the memory of that era alive. With the repetition he was transferring a body of knowledge about a unique and special time in music history that would be forever gone except within the psyches of his students, his children, and anyone else who would listen for a minute. Much later, when we were colleagues, I learned more about Dave's talent. In the ballet orchestra we could get away with a few things those musicians who perform on a stage can't, and Dave got away with playing more than what was written. He played the melody, some of the harmony, some of the inner voices, even some of the percussion, hence this piece - Ballet Fantasy which is a tribute to his ability to emulate the rest of the orchestra just with his bass and bow - with perhaps some whistling and sotto voce singing. He played the parts better than they were being played by the instruments they had been written for. And, he would make me crack up while he was doing this (especially while the conductor was looking our way). By the way, a coda in a ballet doesn't refer to just the end of a piece, but a whole piece in and of itself, usually a fast finish after a slow pas-de-deux, and solo numbers by the two principal dancers. I mentioned how smart he was; that was abundantly clear during orchestra contract meetings. You may know that orchestra managements and committees can on occasion, shall we say, be full of B.S., as it were. During these meetings, Dave would listen to various obfuscations, rantings, sophistries, stretches of logic, etc. in silence, but occasionally he would tentatively raise an index finger to make a point, and in one or two short sentences would get to the gist of the matter at hand and leave all the various spokespeople tongue-tied and embarrassed. I endeavor to emulate him in more ways that I could ever tell. In tribute, I am proud to present him with my part of this long overdue and absolutely well deserved album of music.